Bridgetown, BARBADOS - Once again a selection of Caribbean Speciality Food and Beverage companies will be gaining growth from the international markets when they showcase their products at the ANUGA 2015 trade fair, under the umbrella platform Caribbean Kitchen. ANUGA is the world’s leading food fair for retail trade, food service, and the catering market with around 6,800 exhibitors from 100 countries expected to display their goods to 155,000 visitors. 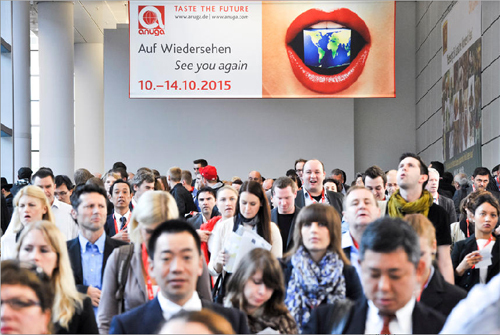 Spanning the entire 284,000 m² fair grounds in Cologne, Germany, ANUGA takes place from 10 to 14 October 2015. Following the success of Caribbean Kitchen’s debut at ANUGA in 2013, the Caribbean Export Development Agency (Caribbean Export), funded by the 10th European Development Fund (EDF) and supported by Deutsche Gesellschaft für Internationale Zusammenarbeit (GIZ) is assisting 12 food and beverage producers to attend this years’ trade fair. Representing 6 Caribbean Islands, the exhibitors will bring a range of exotic Caribbean sauces and condiments, liquors and beverages, and cocoa and chocolates to the forefront. The Caribbean is the birth place of rum and this year rum will be represented at Caribbean Kitchen in three distinctly unusual forms. SMAKS Luxury Group Ltd., from Trinidad and Tobago, will present the world’s only Chai Rum, an exceptional limited reserve rum infused with tea and botanicals. 10 Saints Brewery Co. Ltd from the island of Barbados will showcase its premium micro-brewed lager which is aged in rum casts, producing a smooth full flavoured lager with oak and rum notes. From Dominican Republic J&J Spirits, under the brand name Kalembu, will display a family owned line of hand made all natural spiced rums. Also from Dominican Republic Benedicta S.A. will unveil the only apple cider produced in the Caribbean and Perishables Jamaica Ltd using authentic Jamaican herbs will exhibit its range of herbal teas with flavours from ginger and lemongrass to neem and moringa. The rapid growth in demand for fine flavoured cocoa is set to continue bringing lucrative benefits to the Caribbean’s fine cocoa industry. This year, three cocoa and chocolate manufacturers will be represented in the Caribbean Kitchen pavillion. Coldbrush Organics Ltd from Jamaica produces organically grown single origin cocoa products and chocolate bars infused with natural Caribbean fruits, nuts and spices. Tan Bun Skrati N.V., from Suriname, uses Trinitario cocoa beans to produce its cocoa. Using traditional processing methods, these handmade chocolates have a flavour that is unique with notes of flowers, fruits, dairy, spices and nuts. From Dominican Republic, Rizek Cacao S.A.S. creates cocoa butter, mas and powder manufactured from wet cocoa beans creating its own distinctive flavour profile. It is the herbs and spices originating from the Caribbean that differentiates the region’s cuisine from the rest of the world. From the island of St. Vincent, Vincifresh Ltd with its “Harvest to Home” approach will exhibit marinades, pepper and chilli sauces, and syrups and cordials under the brand Winfresh. Also bringing pepper sauces to Caribbean Kitchen is BnRs Holdings LLC., from Jamaica with its jerk based products ranging from finishing table sauces to cooking seasonings. Producing soy based marinades, barbeque sauces and condiments under the brand Sishado, Gom Food Industries NV from Suriname has a unique flavour profile formed from a mix of Amazonian, Caribbean and Asian ingredients. In a category all on its own, Procesadora Vizcaya from Dominican Republic will be exhibiting the finest selection of tropical fruit jams, pulps, fruit in syrups, and fruit pastes under the brand name Delifruit. Caribbean Kitchen is pleased to showcasing some of the very best that the region has to offer and is looking forward to facilitating these companies in the developmental process as they journey towards their export goals.